by Roy A. Teel Jr. I do believe that Jerry Brown has some form of dementia. 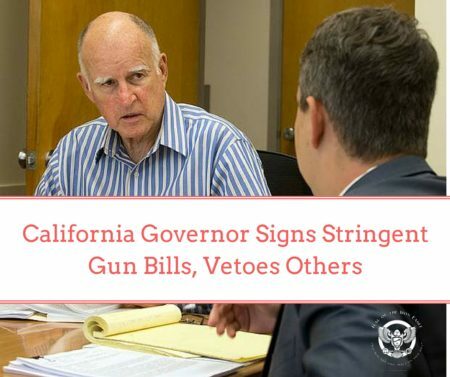 He’s old; he rarely makes sense, now he has just made California the most dangerous state in the U.S. for its law abiding citizens. San Bernardino is the murder capital of California followed by Oakland. Both cities also have the most corrupt police departments in the state. These laws are not going to do anything but put law abiding citizens in even more danger. Brown and his ‘demoncratic’ cohorts don’t get it. Criminals don’t obey laws. That’s why they are criminals. His ban, and demand that law abiding citizens give up their second amendment rights and surrender their ammunition clips, which hold more than ten rounds, to the state, is nuts. Why not pass a law that California is a “gun-free zone?” Then criminals and mass killers could just murder with impunity as ALL citizens would be ‘unarmed.’ Jerry Brown is either a complete moron or does have some form of dementia or Alzheimer’s disease. No one is going to give up their weapons and ammunition clips. These laws will be overturned by the courts before they ever go into effect. If any of this were to go into effect, the only thing that Brown and the ‘demoncrats’ will have done is made this state more dangerous for law abiding citizens while strengthening the criminal element. Jerry Brown is the most dangerous governor in U.S. history. He and his ‘demoncrat’ bedfellows live in some make believe world where they think that laws like this will save lives. They won’t…they will only weaken an already weakened law abiding gun owners’ rights and leave law abiding citizens easy prey for criminals. ‪SHOCK: Another ‪Mass ‪Shooting at ‪Club, But Look Why Media’s ‪‎Refusing to ‪‎Report It. Copyright and Trademark protected property of Roy A. Teel Jr.